CO-ME (Computerize Mechanical Engineering ) is the CAD based Architectural Engineering Design support software. From the basic drawing to execution drawing plan, the entire drawing process on mechanical engineering construction (HVAC , sanitary , heating, air conditioning, fire protection ) can be supported. Based on DB provided and advices from various field coworkers, CO-ME’s powerful function is showing already work efficiency improved more than 200 % in the number of companies across the country by South Korea. CO-ME (Computerize Mechanical Engineering) is full-scale engineering tool about mechanical construction reflect the various engineering data. ① HVAC : Drawing diffuser layout / size calculation / Double Line Drawing / Drawing Automation / Parts design. ② Sanitary and air-conditioning equipment: Drawing symbols sanitary / water supply, hot water supply connection / vent pipe / double line. ③ Firefighting equipment : Sprinklers layout / spray radius / Fire pipe / tube diameter calculation / Fire Symbol. ④ Engineering functions : Create FCU duct and draw line works / Sanitary facilities / pipe size calculation by the flow. 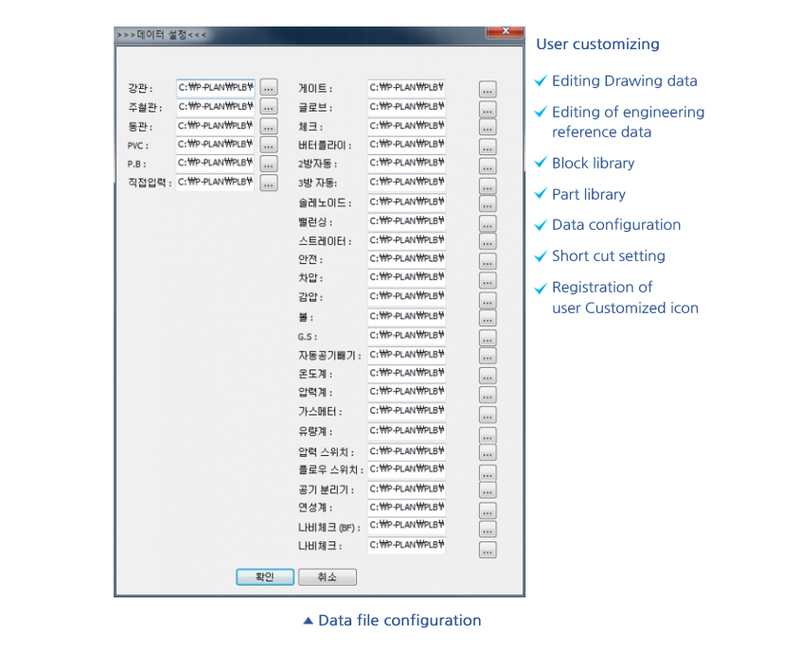 ⑤ Easy user customizing and easy data registration and delete : Modification of Construct Data and Reference Data. Using newly added CO-ME’s palette option for drawing pipe, User no longer has a hassle to pop up dialog box every time. 1. Drawing of double-line pipe can support variable link type option. 2. Detailed piping work status display options (soldering/welding/joint status etc.) are added. 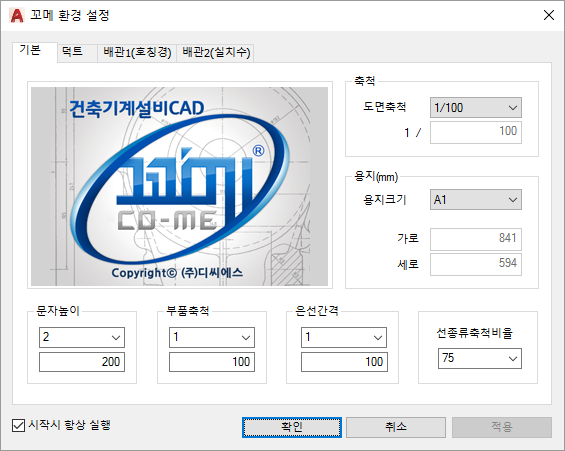 To convert the selected two-dimensional object to specified ISO Metric drawing mode according to viewpoint option. 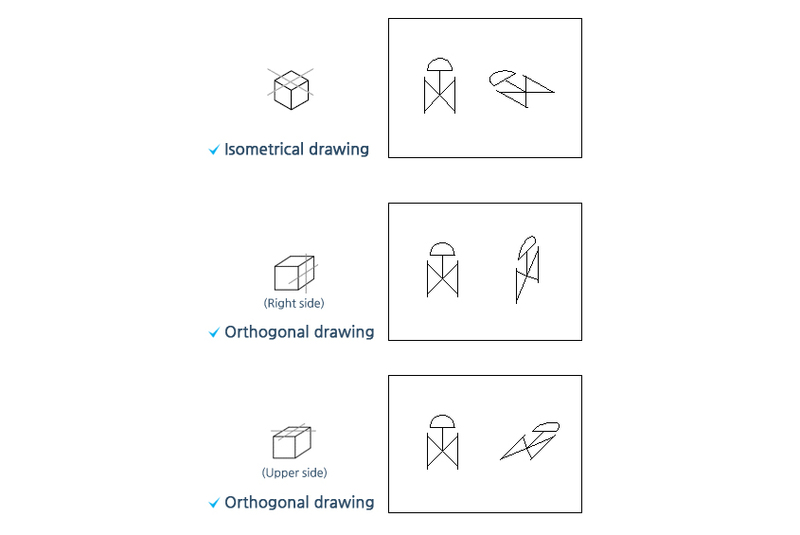 For example, after the completion of valve data, the drawing can be changed to 30-degree, 45-degree isometric viewpoint projection drawings. 6-Axis Text display pattern is support variable ISO Drawing. 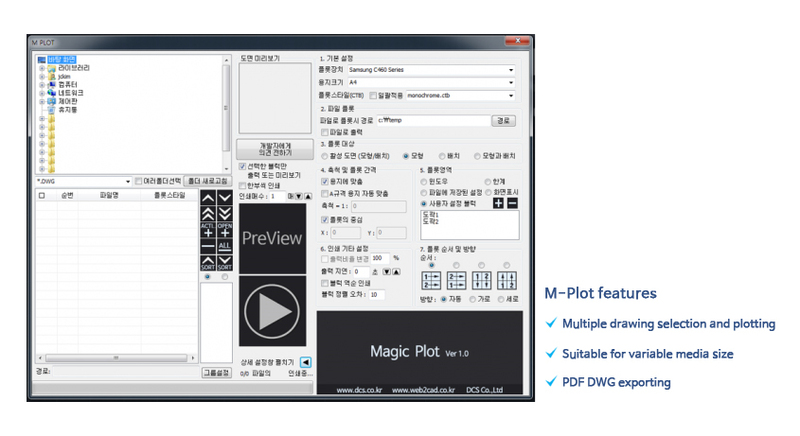 M-plot is a strong plot function to reduce the cumbersome operation and time required to create the output after the drawing. Both single drawing and multiple drawings with various Scale, various direction can be displayed at a time. It can also file generation for multiple extensions, including PDF and DWG. User can register a text and phrases that frequently use. When registering a character, text string including the features of color, style, character, height, etc. Considering the variety of design conditions and user friendliness, various setting option is improved more efficiently.